Cook couscous according to package directions. Drain well, and pour into a large bowl. Toss with 2 tablespoons olive oil, and set aside, stirring from time to time. Stir in cheese, basil, parsley, lemon zest, lemon juice, and pine nuts. Salad should be quite moist, so drizzle with more oil if needed. Season with salt and pepper. 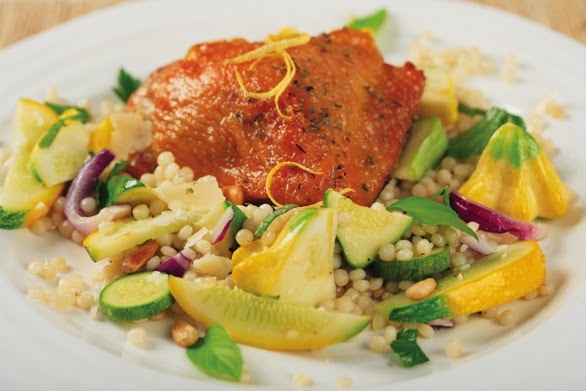 Serve slightly warm or at room temperature with crispy chicken thighs, if desired. Rise chicken, and pat it completely dry with paper towels. Gently pull loose skin so that it covers round top and sides of each thigh, taking care not to rip or tear skin. Positon a rack in the upper third of oven, and preheat oven to 450 degree(use the convectin roast setting if you oven has it) roast until meat is cooked through and skin is very crisp and golden, 15 to 20 minutes(see notes). When meat is pierced with the tip of a small knife, juice should have no traces of pink. An instant read thermometer inserted into thickest part of thing(avoiding bone) should register 165 degree. Serve hot. Note: don’t be alarmed if the chicken fat begins to smoke while you’re roasting these chicken thighs. Just be sure to use a rimmed baking sheet underneath the wire rack to preven oven fires.